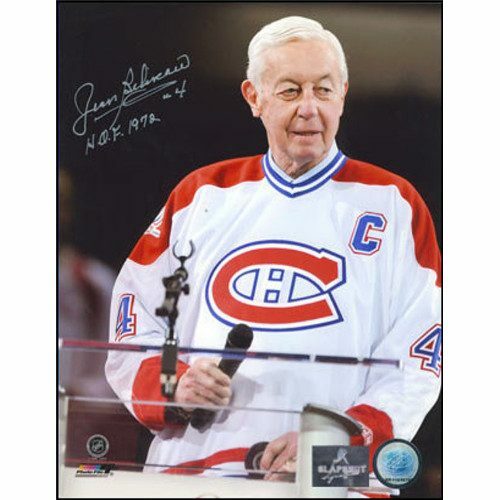 This hand-signed 8X10 photo has been personally autographed by Jean Beliveau. To protect your investment, a Certificate Of Authenticity and a tamper evident holofoil from Slap Shot Signatures is included. Jean Beliveau was both a talented baseball and hockey player. He was offered a minor league pro contract at the age of 15 that was turned down by his family. He was also offered an NHL “C-form” contract by the general manager of the Montreal Canadiens-a standard contract that would have required Beliveau to join the Canadiens at a set date and salary. Again, his father refused to sign, instead signing a “B-form,” agreeing to play for Montreal if he decided to turn pro. Despite his success in the amateur Quebec Senior Hockey League (QSHL) and two brief appearances for the Canadiens in 1950 and the 1952-53, Beliveau was reluctant to play professionally. Jean Beliveau spent the next 18 seasons with the Canadiens and was a crucial part of their success. Beliveau was a lightning fast skater, talented stickhandler and brilliant playmaker who could also score with his accurate and powerful shots on net. He became an instant fan favorite, all around team player and one of the greatest captains in league history. He played on 10 Stanley Cup winning teams, winning 5 consecutive Cups from 1956-1960. He was team captain for his last 10 seasons, the longest tenure of any captain in club history. Beliveauwas known as a gentleman both on and off the ice, leading by example, he was a mentor to new players and a valued confidant to veterans. Highly respected in the hockey world, Beliveau was the game’s greatest role model. After his retirement, he devoted his energy to helping those less fortunate through several charities. In 1971,Beliveau won his 10th Stanley Cup and his number 4 was retired on October 4, 1971. The Hockey Hall of Fame waived the three year waiting period and inducted Beliveau in 1972. Sadly, Mr. Jean Beliveau passed away on December 2, 2014 at the age of 83. Get your Jean Beliveau Trophy-Signed 8×10 Stanley Cup & Conn Smythe Photo!